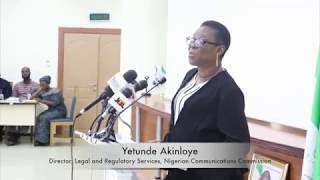 Senator Olabiyi Durojaiye mni, JP is the Chairman of the Board of Commissioners of the Nigerian Communications Commission. Born in Ojowo, Ijebu-Igbo, in Ogun State, to the family of the late Olisa of Ijebu-Igbo; Chief Benjamin Osibanjo Durojaiye, Olabiyi Durojaiye attended Ojowo United Primary School and Molusi College, Ijebu-Igbo, before proceeding to obtain a University of London degree (BSc.) in Economics in 1960, and then an LLB in 1976, also from the University of London, while working in Nigeria. Otunba Durojaiye then took and passed the B.L. (Barrister at Law) Examination at the Nigeria Law School in Lagos in 1979. 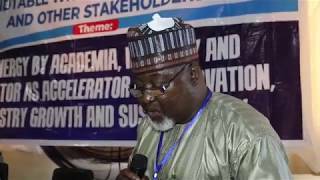 He then proceeded to the National Institute for Policy and Strategic Studies (NIPSS) Kuru, Plateau State, the premier leadership training institute in Nigeria, as a member of the foundation Senior Executive Course (No. 1), obtaining the mni in 1980. Senator Durojaiye's professional career began immediately after leaving Molusi College, starting at the Federal Lands Registry in Lagos in 1954 before going on to the defunct Western Region Public Service in Ibadan, Oyo State in 1957. His twenty three year career at the Central Bank of Nigeria began in 1961 wherein he served in such key positions as Research Officer, Manager Staff Matters, Deputy Exchange Controller, Secretary to the Board and eight years as the Director of Administration by 1984. It was then that Otunba Durojaiye was appointed Executive Director (Finance and Commercial) at the Nigeria Security Printing and Minting Company (the Mint) on secondment from the Central Bank by the Buhari/Idiagbon military administration where he played a key role in the new Mint Board's first task in effecting the change of the colours of the Naira note. While a Director of the Central Bank, Durojaiye served on the Boards of the Nigerian Industrial Development Bank (NIDB) and of the Federal Mortgage Bank. He was also the National Treasurer for seven years and President of Alumni Association of the National Institute for Policy and Strategic Studies from 1988 to 1990. He has also attended numerous professional courses; including courses with the IMF (International Monetary Fund), the Federal Reserve System in the USA and the London City University Business School Course for Senior Bankers and Financial Executives. 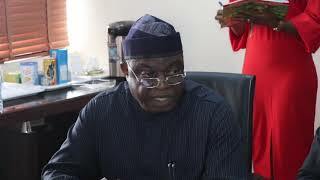 Senator Durojaiye voluntarily retired from public service in 1989, joining the Law Chambers of Chief Rotimi Williams CFR, SAN as a legal practitioner, from which he resigned to contest the botched 1991 - 1992 Presidential election primaries on the platform of the SDP (Social Democratic Party). 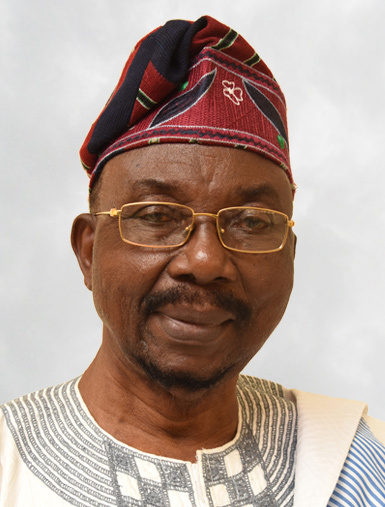 Otunba Olabiyi Durojaiye's political experience and activities includes his election as a member of the Constituent Assembly charged with reviewing the Draft Constitution of the Federal Republic of Nigeria (1988/89) as the representative of the Ijebu-North Federal Constituency. He subsequently served as Chairman of the Registration Committee of the PSP (People Solidarity Party) under the political transtion programme instituted by the military regime of General Ibrahim Babangida. From 1993 to 1999, Olabiyi Durojaiye was an active member of Afenifere and the National Democratic Coalition (NADECO) that successfully fought for the end of military rule in Nigeria, which resulted in his imprisonment under solitary confinement from 3rd December, 1996 to 16th June 1998 (560 days) by the military government of the late General Sani Abacha. Following his release upon the end of the General Abacha regime, Otunba Olabiyi Durojaiye contested and won the Ogun East Senatorial seat in the Senate, serving from 1999 to 2003, where he was Chairman of the Establishment and Public Service Committee. Today, Senator Durojaiye is an elected member of the Board of Trustees of the All Progressives Congress (APC), representing Ogun State in the Party’s Convention of 2014. Nigeria Tomorrow: My Vision and Mission - February, 1992. Guided by His Hands: An Autobiography to Mark My 80th Birthday - February, 2013. Otunba Olabiyi Durojaiye was a member of the Parish Council (now Standing Committee) and President of the Christian Morning Star Society of St. Matthew’s Church (now the Cathedral) Ojowo, Ijebu-Igbo since 1985. He was happily married to the former Miss Olufunso Olubanjo for 50 years (9th April, 1959 – 7th June, 2009) when she peacefully transited to the great beyond. Their marriage was blessed with two sons, four daughters and many grand children. Senator Olabiyi Durojaiye was nominated Chairman of Nigerian Communications Commission by President Muhammadu Buhari GCFR, on August 2, 2016, and confirmed by the Senate of the Federal Republic of Nigeria on November 17th, 2016.